Good afternoon, friends from the press. Today is the Journalists' Day. I would like to wish you all a happy holiday. I want to avail myself of this opportunity to extend my gratitude to you for your active participation in and support for the Foreign Ministry's regular press conference. Recently there are a number of important events and activities. You have been working so hard. We hope to continue maintaining good cooperation and close contact with all of you. Q: President Trump's special plane, Air Force One landed in China about half an hour ago. A senior White House official who accompanies President Trump said to the reporters that the United States will ask China to strictly abide by the UN resolutions and cut financial links with the DPRK. This senior official also said that there was still trade activity taking place along the China-DPRK border and there were still financial links between the two countries. How do you respond to this? A: I am not aware of the latest information you mentioned. China's attitude on the DPRK-related resolutions of the UN Security Council is quite clear-cut. The Chinese side always implements the DPRK-related resolutions of the UN Security Council in a comprehensive, strict and faithful manner and earnestly fulfills its due international obligations. As for the items explicitly prohibited in the relevant resolutions of the UN Security Council, we act in accordance with them strictly. If there indeed exist some activities or actions that violate the stipulations in these resolutions, once confirmed, China will investigate and deal with them in strict accordance with the law. What is beyond doubt is China's resolve and sincerity in implementing these resolutions in a comprehensive and strict manner. Meanwhile, I would like to reiterate that besides stipulating relevant sanctions, the relevant resolutions of the UN Security Council also call on all relevant parties to create enabling conditions for peacefully resolving the Korean Peninsula nuclear issue through political and diplomatic means at an early date. We also hope that all relevant parties can bear this in mind. This is implementing these resolutions in a comprehensive, strict, faithful and accurate manner in the real sense. Q: Recently, Saudi Arabia successfully intercepted the missile launched by the Houthi forces in Yemen to the Riyadh airport. Saudi Arabia said that it was Iran that provided arms to the Houthi forces. What is your comment on the current situation in this region? A: The military conflict in Yemen has lasted for two and a half years and seriously affected regional security and stability. The pressing task now is to call upon relevant parties to engage in dialogue and negotiation in accordance with the relevant resolutions of the UN Security Council, the initiatives of the Gulf Cooperation Council and their implementation mechanism and the outcome documents of the national dialogue conference so as to find an inclusive solution at an early date and restore the stability and normal order in Yemen. The actions which will escalate or enlarge the scale of the conflict are not conducive to achieving the above-mentioned goals. Q: Firstly, today President Trump has wrapped up his visit to the ROK. During this visit, President Trump's statement on the Korean Peninsula nuclear issue has somewhat changed, saying that he will bring the DPRK back to the negotiating table for consultation. What are China's comments on President Trump's visit to the ROK? Secondly, when delivering his speech at the ROK National Assembly, President Trump urged China and Russia to stop doing business with the DPRK. What is your comment on this? A: On your first question, we all pay great attention to President Trump's Asian tour. It is up to the ROK side to make comments on President Trump's visit to the ROK. We have noted President Trump's statement on the Korean Peninsula nuclear issue during his visit to the ROK, including the relevant speech delivered at the ROK National Assembly this morning. I would like to reiterate that China's position on the Korean Peninsula nuclear issue is consistent and clear-cut. We stay committed to realizing the denuclearization of the Korean Peninsula, maintaining the peace and stability of the Peninsula and resolving the issue through dialogue and consultation. Currently, the situation on the Korean Peninsula remains complex and sensitive. We hope that all relevant parties can make concerted and positive efforts to ease the tensions on the Korean Peninsula and bring the Korean Peninsula nuclear issue back to the track of seeking settlement through negotiation. 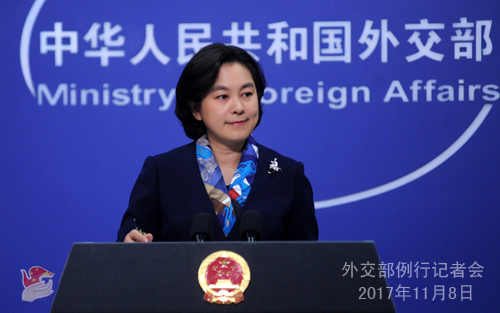 On your second question, when answering the question raised by the journalist from the Reuters just now, I said that as for the items explicitly prohibited in the relevant resolutions of the UN Security Council, the Chinese side fulfills its international obligations in a comprehensive, strict and faithful manner. Q: According to the reports of certain foreign media, the recent launching of China's cutter-suction dredger named Tiankun will enhance China's capability to reclaim islands from the sea. They are concerned about this. What is your comment on this? A: Tiankun represents China's new achievement in the area of dredging equipment development and construction. We hope that relevant media can put China's scientific and technological development and engineering progress in perspective and refrain from making unwarranted connections, or even staying panic-stricken and being jittery with imaginary fear. 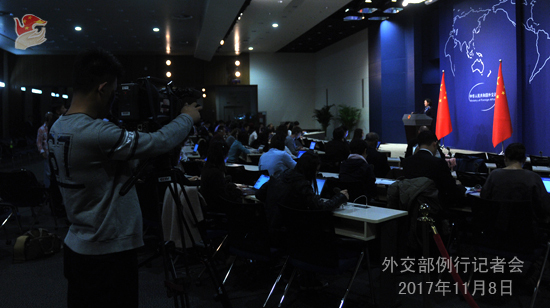 Q: It is learned that travel agents based in Dandong have been told to stop arranging the Chinese tourists to travel to the DPRK. Can you confirm this information? A: I am not aware of the information mentioned by you. Q: Firstly, we have noted that the Chinese side has made high-standard arrangements to receive President Trump in a thoughtful manner. Can you tell us the background and purpose of these high-standard arrangements? Secondly, what outcomes does the Chinese side expect to be achieved during the meeting between the heads of state of China and the United States? What is the significance of this meeting to China-US relations in the future? A: With regard to your first question, the Chinese side attaches great importance to President Trump's visit to China. In addition to the whole set of activities for the state visit, the two heads of state will also have small-group and informal interactions, which can give them enough time to have an in-depth and strategic exchange of views on major issues of common interest. We believe that the exchange of views can help the two sides to enhance mutual understanding and mutual trust and is conducive to the growth of China-US relations in the future. Regarding your question on the background and purpose of this high-standard reception, I cannot understand what you mean. President Trump has just visited Japan. The government of your country, that is to say, the Japanese government also provided a high-standard reception and made all-out efforts to satisfy the guest, didn't it? This is what any host country should do. With regard to your second question, this is the first state visit received by the Chinese side following the successful conclusion of the 19th National Congress of the Communist Party of China (CPC). Against the backdrop that today's world is in the midst of profound and complex changes, the heads of state of China and the United States are about to meet in Beijing to have another strategic exchange of views on major issues of common interest, reach new important consensus on the basis of the Mar-a-Lago meeting and the Hamburg meeting. This is of great significance to moving forward China-US relations in the new era and this is of positive and vital importance to promoting the peace, stability and prosperity of the Asia-Pacific region and the world at large as well as jointly addressing some common global challenges facing our two countries. We are willing to join hands with the United States to act upon the important consensus reached by the two heads of state to focus on cooperation and properly manage differences in the spirit of mutual respect and mutual benefit so as to ensure the sustained, sound and steady growth of China-US relations. Q: Can you introduce President Trump's schedule for this afternoon and evening? A: I can understand that you are all quite interested in this question. President Trump has just arrived in Beijing and please await the information to be released soon. 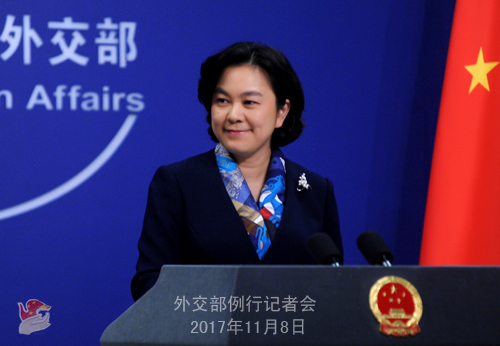 What is clear is that the Chinese side attaches importance to President Trump's visit and as the host country, China will do the honors and make thoughtful arrangements to facilitate the in-depth, candid, friendly and strategic exchange of views on major issues of common interest between the two heads of state. Q: It is reported that the Myanmar energy minister yesterday said that Myanmar was not so enthusiastic to proceed with the Myitsone hydropower project in Kachin State, which is an important project invested by China. Can you offer us more details on the progress of the negotiations between China and Myanmar? A: We always stay committed to deepening the economic and trade cooperation with Myanmar on the basis of mutual benefit and win-win outcomes. The Myitsone hydropower project is a commercial cooperation project agreed by the two sides and it has completed all the review and approval procedures. We will continue to stay in communication with Myanmar and handle the difficulties in the cooperation project in a proactive and proper manner, so that the relevant cooperation will continue with sound and steady development to deliver greater benefits to the two peoples. Q: The Russian ambassador to India yesterday said that India and China should enhance understanding on the Belt and Road Initiative and should discuss their differences and resolve them. What is your comment on this? A: We could tell that the Indian side has been rather hesitant about the Belt and Road Initiative since this question was raised by you and other reporters from India previously. Since the Belt and Road Initiative was put forward by President Xi Jinping in the autumn of 2013, it has progressed in a smooth way with fruitful outcomes and gained extensive approval and support from the international community, and an increasing number of countries have actively engaged in the international cooperation under the Belt and Road Initiative. The just successfully concluded 19th National Congress of the CPC explicitly pointed out that we need to proactively promote the international cooperation under the Belt and Road Initiative and enshrined the building of the Belt and Road into the CPC Constitution. This testifies to the great importance China attaches to the Belt and Road as well as its resolve and confidence in firmly advancing the international cooperation under the Belt and Road Initiative. We are convinced that the advancement of the Belt and Road will create greater room for China's opening-up and development and present more opportunities for the development of various countries as well as global economic growth. We stand ready to work with other parties in a concerted effort in the principle of extensive consultation, joint contribution and shared benefits to continue advancing the Belt and Road Initiative, seek greater synergy of development strategies and enhance practical cooperation in various fields, so that the international cooperation under the Belt and Road Initiative will bring benefits to countries along the route in a better, faster and more extensive way. We understand India's concern on this issue. As we said multiple times, the China-Pakistan Economic Corridor is an economic cooperation initiative that doesn't target a third party and has nothing do to with territorial disputes. The Belt and Road Initiative is an open and inclusive cooperation framework. We hope to work with countries that share the same vision and identify with the initiative to achieve common development through cooperation and bring benefits to the people.